Completing a bachelor’s degree in criminal justice can help you prepare to enter the police academy or for other law enforcement training opportunities. However, this versatile degree can also kick-start your criminal justice career in a variety of other law enforcement-related paths. Graduates of Maryville’s criminal justice/criminology degree program will be able to apply their knowledge of criminology, the law, and its enforcement in multiple career settings. Here are a few possibilities. From private security firms to the government, a wide range of institutions and companies work with criminal justice graduates. The following industries and sectors commonly employ graduates with criminal justice degrees. Criminal justice graduates work in a variety of different capacities within the criminal justice system. The following are some of the most popular positions that criminal justice graduates often pursue. 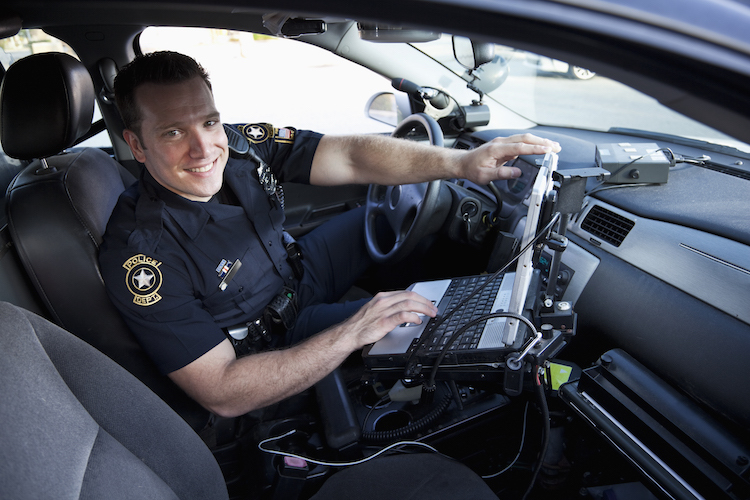 While acquiring a criminal justice degree can help an aspiring law enforcement professional begin the process of pursuing a career in criminal justice, acquiring the degree itself does not guarantee employment. Many positions in criminal justice may call for police academy training, ample experience, and/or advanced degrees or specific certifications. This depends on the responsibilities associated with the title, but earning a criminal justice degree is a pivotal step in the process. Police officers are responsible for protecting and serving citizens. They enforce laws and ensure the protection of both lives and property. A police officer’s responsibilities vary tremendously on a day-to-day basis. In a single day, an officer may be responsible for responding to both non-emergency and emergency calls, patrolling particular areas, conducting traffic stops, and issuing citations. Detectives, on the other hand, have a more specialized role. They serve as investigators, gathering facts and evidence for specific criminal cases. Most detectives start their careers as police officers. Police officers and detectives generally need to attend and graduate from their agency’s training academy before completing a period of on-the-job training. While a high school diploma or a GED may be sufficient for some police officer positions, some departments may require an undergraduate degree in criminal justice or a similar field, along with additional training depending on state, city, or county regulations. Additionally, some departments may have employment requirements for detectives beyond an undergraduate degree, including advanced training and ample law enforcement experience. Computer forensics investigators work with law enforcement agencies to retrieve information from computers to assist in crime solving. These investigators will have a strong working knowledge of computers — often the equipment they’re working with will be damaged in some way. In addition to working with law enforcement, computer forensics investigators can also work privately, testing the integrity of a company’s information technology systems. While becoming a computer forensics investigator requires additional training, education, and certifications in specific subsets of information technology and cyber security, a criminal justice degree can help students gain some of the necessary skills needed to start down the path to becoming a computer forensics investigator. For instance, a criminal justice degree can help aspiring investigators develop an understanding of the courts system, as investigators are often called upon to testify about the evidence they retrieve from a computer. Air marshals are law enforcement officers who have jurisdiction when a passenger flight is in the air. They are responsible for protecting passengers against potential crimes and terrorist violence. On the ground, air marshals work with other agencies to protect against the risk of terrorism. Becoming an air marshal requires several steps — for one, candidates are expected to have a great deal of experience in law enforcement, and they also need to complete a range of additional training programs with the Federal Air Marshal Service (FAMS). Additionally, the application process is rigorous, as it includes a physical training assessment, a written application, psychological assessment, an interview, and more. Drug Enforcement Administration (DEA) agents protect the United States by identifying, investigating, and immobilizing drug traffickers. DEA agents work toward the administration’s goal of eliminating the distribution of illegal drugs by prosecuting traffickers. A bachelor’s degree is one of the minimum requirements to become an agent; the DEA agent position is one of the most coveted in law enforcement, and candidates with robust experience, education, and qualifications may have a competitive advantage for being selected. The recruitment process also includes physical and psychological assessments, a polygraph test, background check, and panel interview. Probation officers supervise offenders that have been released into the community with conditions — usually to maintain good behavior and obey certain restrictions. Offenders report regularly to their probation officer, who provides social services to help them rehabilitate. Probation officers typically work either with juveniles or adults, and are responsible for documenting the rehabilitative progress of the offender(s) assigned to them. A criminal justice degree can help a student start the process of becoming a probation officer; however, it is important to note that additional training and certifications are also typically required to become a probation officer. Corrections officers oversee inmates in correctional or rehabilitative facilities. These officers often work long hours in potentially risky environments as they are dealing directly with inmates. While some corrections officer jobs do not require a bachelor’s degree, having a criminal justice degree may improve the chances of advancing to a higher-paying position or a leadership role. Educational requirements aside, candidates who lack the necessary experience will also have to pursue additional training or certifications, depending on their state. Law enforcement meets the outdoors in a job as a fish and game warden. These wardens enforce laws related to hunting, fishing, and boating, and patrol wilderness areas where these activities take place. Students interested in conservation, climate change, and wildlife may find this career path rewarding, as will those interested in working in a variety of environments, from wildlife refuges to popular national forests. Depending on the exact role, additional training through state departments or federal agencies will also be required to pursue this career option. The primary mission of a customs and border protection officer is to prevent terrorism. Working at airports, land crossings, and ports, border services officers also protect against the smuggling of illegal drugs and other items, enforce immigration and trade policies, and protect the country’s agriculture. A four-year degree — or a combination of education and work experience — is required to apply for the position, along with additional specialized academy training. Those who are interested in a career in law enforcement or criminal justice shoulder consider pursuing a bachelor’s degree in criminal justice/criminology. Learn more about Maryville University’s online Criminal Justice/Criminology program and start actualizing your criminal justice career goals. Now that you have a better understanding of potential criminal justice careers, discover what criminal justice is in the modern world.